FS Insider recently interviewed Chris Puplava, CIO of Financial Sense Wealth Management, to discuss the bonanza in stock buybacks by US companies, why risks are brewing for emerging markets, and how we now see an inversion in the “private” yield curve, which has flagged financial troubles in the past. A number of emerging markets are experiencing stress with the Argentine peso, Turkish lira, and Brazilian real all down significantly against the dollar, Puplava noted. One of the biggest problems with a weaker currency, he explained, is that for those countries carrying large loans denominated in US dollars, as their home currency falls, those loans become more and more expensive to pay back. 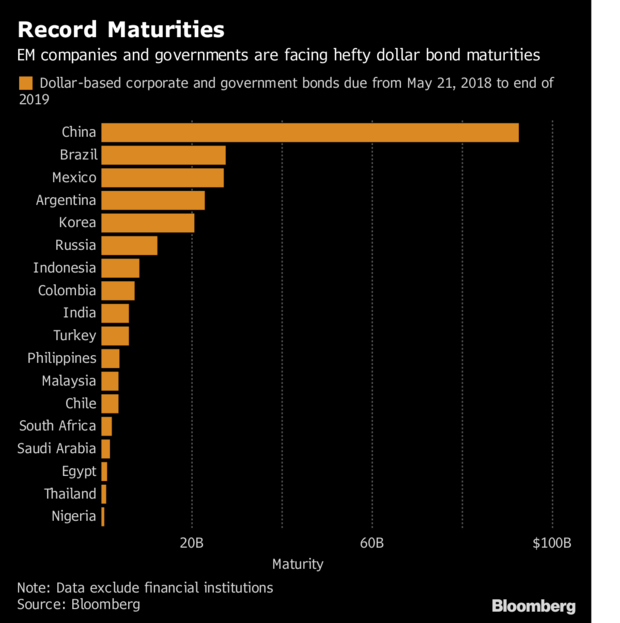 Bloomberg recently showed the rather hefty dollar-denominated debts coming due over the next year and a half with China, Brazil, Mexico, and Argentina at the top of the list. 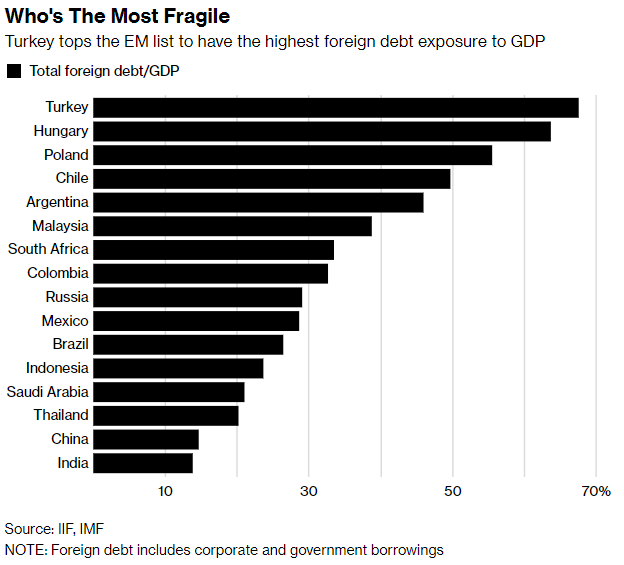 Though China tops the list in terms of dollar-denominated debt coming due, Turkey, Hungary, and Argentina are the most vulnerable when you account for debt exposure relative to the size of their economy, he noted. Charles Gave at Gavekal Research, who we spoke with March 29th (see Charles Gave: Possible Paradigm Shift Ahead), showed that we actually did have an inversion of the private yield curve in December of 2017, a month before the last major selloff and market peak. The private yield curve provides more information than the public yield curve, Puplava said, but its inversion also doesn’t automatically mean we’re moving into recession. “While we did have inversions that did not lead to recessions, they were very good predictors of financial instability,” he said. “When we see a yield curve inversion in the private yield curve, that is a warning of financial trouble ahead,” as we see currently. The Fed is unlikely to step in here as well, as it hasn’t been responsive to changing policy given recent declines of over 10 percent. To hear this full interview with Chris Puplava and all other interviews with guest experts, click here for a free trial. For more information about Financial Sense® Wealth Management and our current investment strategies, click here.